Turkish coffee is a very flavorful, and often strong, coffee. 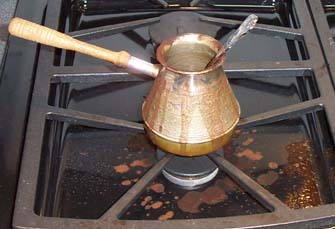 It is prepared in an ibrik, a small pot that holds either one or two servings. Traditionally, the pot was placed in the hot sands of the Mediterranean for cooking, personally, I use my gas stove. An ibrik and a heat source, coffee, water, and sugar. Ibriks are available from several web sites ... see the LINKS page. Or, do what I do, get a Russian ex-girlfriend to buy one for you! They are also known as a cezve, briki, mbiki or toorka. The heat source is typically your stove, gas or electric. The coffee may be any roast but my personal favorites are Starbucks Breakfast Blend or the Turkish Blend from Natasha's Cafe. Turkish coffee uses the finest grind you can have. The coffee becomes more like a powder than anything else. On most machines, it is the finest grind possible. Add the sugar first. For an 8 oz. ibrik, Natashas Cafe recommends 2 level teaspoons. I use anywhere from 1 level tablespoon (=3 teaspoons) to 2 rounded tablespoons, depending on who is joining me! Several people I know just use one packet of Equal, ... not authentic, but it works! Fill your ibrik with water up to the point where the ibrik's neck starts. The water should come up to, but not into, the neck. You can't really make a smaller amount, you would need a smaller ibrik. The level is important for the physics behind how it works. This is a picture of a heaping teaspoon. Study it carefully! In a small ibrik (4 oz.) use 2 heaping teaspoons. An 8 oz. ibrik, use 3. A 12 oz., use 6. Yes, I know that is not a geometrical progression, but this is an art, not a science. Note how the coffee grinds float on the water. This is important, DO NOT STIR. The grinds actually act like a seal between the water and the air. This is important. You will stir in a later step, but for now, the floating coffee is necessary. Now for the heat source. Since the sands of Revere Beach are not hot enough, I use my gas stove. Just about anything should work. Purists will tell you to heat the coffee very slowly. I say medium to high heat works. DO NOT WALK AWAY! After a few minutes things will start to happen. If the water starts to boil, you did not use enough coffee. The coffee should never boil ... toss and start again. The coffee should start to foam. The difference is the foaming is slow, boiling is fast. You should see the foam grow from around the coffee and start to fill the neck. DO NOT STOP WATCHING! Click on the image on the left to enlarge it. Notice the foam building. The foam will start to fill the neck and work its way up. When it is almost to the top of the ibrik, remove the ibrik from the heat source. Carefully stir the coffee and the foam will subside. Put the ibrik back on the heat source. It will start to foam again, this time more quickly. Again, remove from the heat source, stir down the foam, and replace. Repeat a third time, the foam rises, remove, do not stir unless you are doing the optional step. OPTIONAL STEP: Everyone says you are done at this point. Personally, I repeat the foam/stir a fourth time ... just like turning up the volume to 11 in This Is Spinal Tap (yes, I am old). You do not stir the last time. Some people love the foam, others loath it. At this point, scoop out the foam with a spoon and either 1) place it all in your cup, 2) place an even amount of foam in each cup, or 3) gently place it in the drain of your sink. Let the ibrik sit about 30 seconds so some of the grinds will settle. Then pour yourself as much of the coffee as you want, dividing the rest (if there is any) among your lucky guests. Dont pour out the last drop since the bottom of the ibrik will be sludge. Black? Of course. But your guests may add milk, or better, half and half. Note in the picture that you can see the grinds settle in the cup on the left. The crema or foam on top is seen on the right. Both are delicious. Be warned, and warn your guests, the grinds will settle to the bottom of your glass / demitasse / mug. RELAX, ENJOY, TAKE A BOW. But please dont tell anyone how to make it, it is our secret! Turkish coffee is typically served in a demitasse cup. I much prefer a mug!! There is no reason not to drink it by the mug, I guess it is just an American thing. It is not always easy to get the correct grind. Make sure that the machine is set for Turkish, which is one step finer than espresso. I have found that in a pinch, espresso grind will kind of sort of work. I also like a more mild roast since Turkish coffee really brings out the flavor. Stronger roasts are also very popular.